Thank you for filling the boxes in the lobby. They are waiting to be filled up again. All donations go to local charities. As the High Holidays approach we will have shopping bags in the lobby. This is part of our traditional collection for people who are homebound. Please fill these bags for people and their pets. Last year we had the biggest collection in some years. Can we do this again? The first one for this year will be on Sunday, November 7th at the Temple. I will inform you later about what foods to bring in. 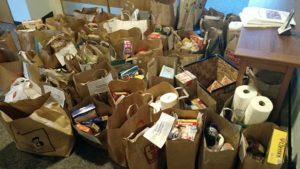 Thank you for your contributions of food and time to the Lowell Transitional Living Center. The date of the next meeting will be Sunday, Sept 18 at Drew Farms after apple picking. Please contact Frank (social@temv.org) if you want to be kept informed of the final details. Please attend and bring your ideas. We will plan the Social Action Sabbath service for December and Mitzvah Day in March and more.